‘Musical Village’ is a family of adult and children's community choirs based in Leicestershire. It has been set up with the intention to bring communities together, and to provide both adults and children an enjoyable and affordable opportunity to take part in community singing. The choirs are non-auditioned – everyone who enjoys group singing and who wants to share this with the community is welcome. No previous experience or the ability to read music is necessary. All groups take part in local community events, and have the chance to participate in larger scale concerts involving all ‘Musical Village’ groups. Musical Village members also have the opportunity to perform with well known singers at prestigious venues throughout the UK. Over the years, Musical Village and its members have raised thousands of pounds for charity. 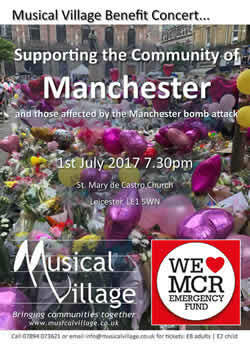 In July 2017 we raised £1000 supporting the community of Manchester after the bomb attack. 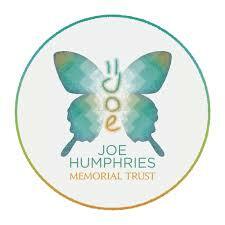 In 2015 we raised money to support the Joe Humphries Memorial Trust (JHMT). Christian Smaditch, our accompanist, organised a concert at Leicester Cathedral in October 2015 and raised £4000 for this charity. promote research into, and awareness of, sudden unexpected death in young people. promote education and training for young people and those who live and work with young people, into how to react to unexpected life threatening situations. inspire young people to fulfil their potential and develop their talents.